When bombs start falling, most people aren’t thinking about getting an education. Setrag Hovsepian, however, was; and that made all the difference. 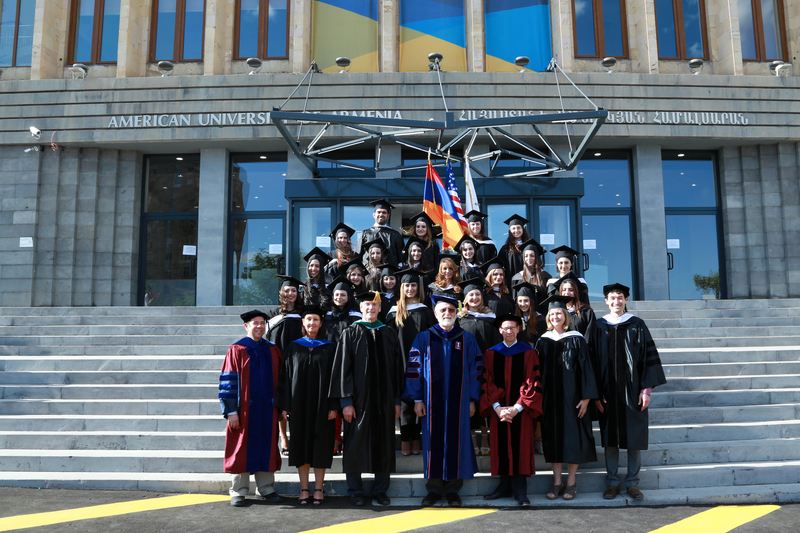 Setrag, known as Seto to his family and friends, graduated this past June from the American University of Armenia (AUA) Teaching English as a Foreign Language (TEFL) Master’s Program. Delivering the valedictorian’s speech before his classmates, professors, and parents, he told a moving and compelling story of how AUA saved his life – twice. The first time AUA saved Seto’s life was when, still living in Damascus during the civil war, he received his acceptance letter. Upon reading it, he hurried out of his bedroom in order to announce the good news to his parents. This is when a shell fell on his bedroom. The second was when he completed the AUA TEFL program, an achievement which he says granted him the opportunity to start a new life and career in his fatherland. Seto has fond memories of his childhood growing up in Damascus, Syria. He grew up in what he describes as a traditional Armenian family: a father who was an optician, a mother who was a French teacher, and an older sister he says is the strong one between the two of them. Hovsepian’s childhood was nothing if not normal: boy scouts, choir, basketball. Both of his parents were involved in the Armenian community and so were he and his sister. “I had a good life,” he says. Little did he know at the time that his privileged life would come to a halt in 2011 as a result of the devastating Syrian civil war. Seto’s path to AUA was at the same time treacherous and serendipitous. He first visited Armenia as a volunteer with Birthright Armenia and the Armenian Volunteer Corps. During his stay, he had a chance meeting with Satenik Avakian, director of the AUA AGBU Papazian Library. Ms. Avakian was the one who pitched the idea to him: “Why don’t you come here and get your master’s degree?” He thought about it but said no. He needed to go back: his family was in Damascus, his father was in poor health, and he needed to help his family. The AUA brochure that Avakian had given to him rested by his bed as he resumed his previous life in Damascus. 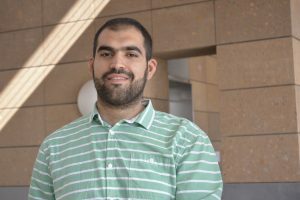 Hovsepian graduated from college in Damascus and started working, but before he had established a career, the Syrian Civil War began. With the outbreak of the war, thousands of Syrian-Armenians were displaced from their homes and many looked to their historic homeland as a refuge. As a result, institutions and people in Armenia, as well as the Diaspora, sprung into action to help ease the jarring experience of thousands escaping the bloody conflict. AUA was at the forefront of this Pan-Armenian effort. The Kablanian Family Foundation, the Zaven Akian Family Foundation, Karnig & Santoukht Mikaelian, Jack Munushian Charitable Trust, to name a few, readily established scholarship funds exclusively for Syrian-Armenian students. These scholarships made it possible for Syrian-Armenian students to enroll free of charge in two courses of their choice offered through AUA’s Extension program and gain the academic foundation, which would then make them qualified to apply for a degree program. Nearly 700 Syrian-Armenians took English and other preparatory and professional development classes at AUA Extension while 42 are now enrolled in full-time degree programs at the university. With his plans for the future in disarray, he thought about what he could do, not just for himself but for his family. He picked up the brochure at his bedside, remembered Avakian’s words, and applied to AUA. When Hovsepian first arrived at AUA, he entered an unfamiliar world, Seto admits. He didn’t know any of his classmates, he spoke a different dialect of Armenian, and there were cultural norms which were alien to him. The rough road left him dejected at first and made Seto feel marginalized and doubtful of the wisdom of his choice. That’s when professor Rachel Ferreli stepped into his life. Hovsepian says of Ferreli, “she helped me so much” as he talks about how she introduced him to other students, including other Syrian-Armenians, and helped him get acquainted with his new environment. Since that day, Seto became an integral part of university life, forging friendships, learning new skills, and expanding his professional network. This experience, he acknowledges, would not have been accessible to him had it not been for the support of the AUA community and especially the aforementioned generous financial assistance programs. Besides the Scholarship Fund for Syrian-Armenians, most of whom get a 100% tuition waiver, the University subsidizes almost 66% of the cost of education for all students, 50% of whom get additional assistance in financial aid. Since its inception, it has been part of AUA’s mission to never turn away qualified students for financial reasons. Besides need-based scholarships, AUA also provides 116 merit-based scholarships to graduate and undergraduate students. Hovsepian was a recipient of need-based assistance and, because of his outstanding academic performance, he also received merit-based assistance, covering over 90% of his university expenses. On Saturday mornings, at the crack of dawn, while most of his peers are still fast asleep, he has already started his two-hour long journey to his job site. Working since he was 18, Hovsepian’s sleeves are always rolled up. In Damascus, he would split his time between classes, his father’s optometry office, and tutoring other students in math, science, and language arts. While working on his master’s degree at AUA, he taught English part-time at Ghoghanj Children’s Center. 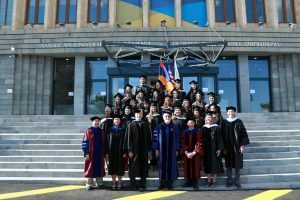 Since graduation, in addition to his work in Yeghegnadzor, he taught two other English courses at AUA Extension in Yerevan, as well as a course in Arabic at YSU. Hovsepian is no exception: 100% of AUA graduates find employment within six months of their graduation, and close to 80% reside in Armenia.The reputation of excellence of the University plays a strong role in employers’ decisions to hire AUA graduates, that reputation is built upon years helping highly skilled and well-rounded graduates enter the workforce and contribute substantively to their chosen field and the Armenian Nation. Educated, sharp, and hard-working, Hovsepian’s qualities and talents aren’t lost on many people who know him. He has been encouraged by friends, family, and colleagues to look for work in the United States and Canada – he’s even been offered a job once. But he doesn’t want to go. He says he enjoys the life he has in Armenia, the ability to spend time with friends and family. He says that if he can have enough work which will allow him to have a relatively comfortable life, he is committed to staying in Armenia. For Hovsepian, those aren’t just empty words: working no less than two jobs and on the clock for more than 6 days a week, he’s doing what he can do make sure his dream of staying in Armenia is a reality.